I honestly can’t remember the first time I read about synesthesia. But what I do know about that moment is that I was instantly fascinated with the concept. The human brain is an incredible machine. And although I’m sure some synesthetes are troubled by their condition, to me–a mere monoesthete (to coin a phrase)–it seems like nothing short of a superpower. If you’re unfamiliar with synesthesia it’s a sensation produced in one part of the body when another part is stimulated. So, for example, a person with synesthesia might smell colors or taste words. Apparently it’s not uncommon for synesthetes to spend many of their formative years blissfully unaware that others don’t perceive the world in the same way they do. Which makes sense when you think about it. I know at some point, likely in my just-shy-of-a-teen years, I was hit with a seemingly momentous philosophical question. It’s a question that I’m pretty sure has occurred to ALL of us at some point in our lives… and that is how do I know that my red is the same as the next person’s red? When you and I look at an apple, for example, we both know that we’re seeing red. But what I’m actually seeing as red could be vastly different from what you’re experiencing. Now, of course there’s a lot of science we could get into here about color and vision. Starting with the fact that color is actually an illusion to begin with. It doesn’t exist. Color is a concept created inside our own skulls by those amazing wetware computers we keep in there. But getting into light wavelengths, rods, and cones would take me down a rabbit hole further than I wanted to go at the moment. So let’s just say that having no idea that your ability to taste words is “different” until you’re a preteen, teenager or even older doesn’t seem strange at all to me. In fact, I have a friend who was in his early 20’s when I accidentally diagnosed his colorblindness for him. But while colorblindness does seem like a deficit to me synesthesia has always struck me as an extra, a bonus. So when these two worlds collided in the story of Neil Harbisson I was gobsmacked. Harbisson was born with total colorblindness, or achromatopsia. Now I think a lot of people may have the mostly mistaken idea when they hear someone is colorblind that means the person sees the world like an old television set. But the vast majority of colorblindness involves the inability to see certain colors in the same way as the rest of us. The most common of which is deuteranomaly, or a reduced sensitivity to green light, like my friend R. And then there is protanomaly which is reduced red light sensitivity. Harbisson’s condition, achromatopsia, however does produce monochromatic vision. People with this rare condition (only one in 30,000 people have it) do actually see the world in shades of gray ranging from black to white. 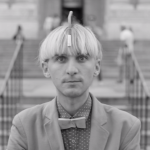 But Harbisson, a British born Catalan-raised artist, decided to turn colorblindness on it’s ear. He gave himself synesthesia… his very own superpower. 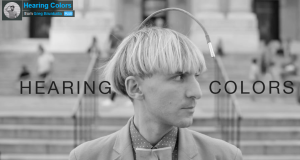 He accomplishes this amazing feat in the most stunningly unorthodox way possible (as if hearing colors could even be orthodox), through an antenna he somehow convinced a doctor to surgically implant in his head. Harbisson is a living breathing cyborg. And that’s not just a figure of speech, he’s actually the first person to be legally recognized as a cyborg by a government, according to his Wikipeedia page. With his antenna Harbisson’s “vision” is even better than yours or mine because he not only perceives visible colors, but invisible ones… infrareds and ultraviolets… too. The colors are audible vibrations in his skull. And his color hearing superpowers aren’t all he can do with that antenna of his. (Hey settle down now, settle down. You know who you are.) The darn thing is freakin’ WIFI enabled and he can receive images, videos and phone calls directly into his head! One source (OK, so maybe not the most reliable one) claims Harbisson has even figured out a way to link up to satellites to view SPACE colors! But instead I’ll just share this video of Harbisson explaining a bit about how his self-induced synesthesia… which allows him to know that the horn of a taxi cab is lime green… works.